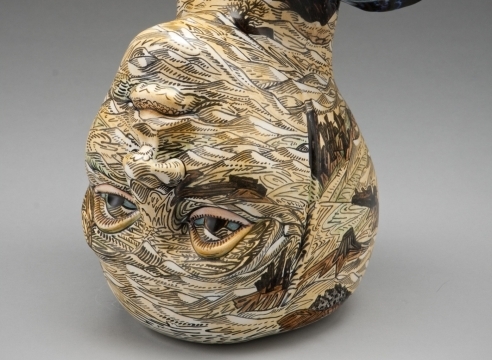 We are pleased to present a new exhibition of work, The Face of Things, by accomplished ceramic artist, Connie Kiener. This show features a selection of sculptures and platters that are both whimsical and mysterious. As her show title indicates, Kiener’s ceramics greet the viewer with myriad ‘faces’ imbedded in images of ‘things,’ ranging from a peach that reads as a curled-up fox, to a human portrait emerging from viney camouflage. The interplay between humor and mystery will capture viewers’ imaginations. A Portland native, Kiener has gained a national reputation as a ceramist. She paints with unusual sensitivity and vivid color bringing narrative and dynamism to the objects she creates. Connie Kiener studied at the Pacific Northwest College of Art, at the Chouinard Art Institute in Los Angeles, and in Umbria, Italy. She has exhibited in galleries across the country and has received several awards and commissions, including a project for the Oregon Convention Center in Portland. Her work is in numerous public and private collections, including the Hallie Ford Museum of Art, Willamette University, Salem, OR; the Smithsonian Institution, and the White House in Washington, D.C., the Arizona State University Museum in Phoenix, and the Arkansas Decorative Arts Museum in Little Rock. 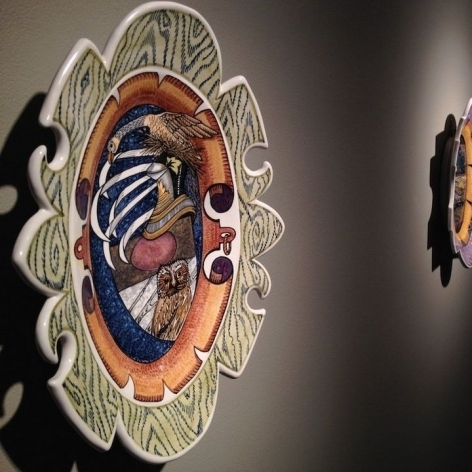 The latest show by Portland ceramic artist Connie Kiener marks something of a breakout, with abstract sculpted pieces are intricately painted and full of complex imagery.